We are the prominent organization of this domain engaged in offering a wide spectrum of Coupling Complete with Hex Screws. 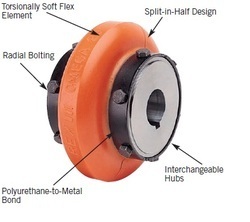 The offered coupling is made from flexible rubber. At our vendor’s end, the coupling is designed to allow some angular misalignment while reducing driveling vibration in mechanical power transmission applications. In addition, clients can also get flexible coupling complete, coupling element, and Kaeser compressor coupling at industry leading prices.